HIGH QUALITY 3M HELICOPTER TAPE AS SUPPLIED BY SPEEDSPORT TO MOST LEADING FORMULA 1 TEAMS! 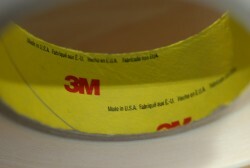 3M TAPE PROVIDES A SIMPLE, EASY, FAST METHOD OF PROTECTING A SURFACE FROM CORROSION, ABRASION AND MINOR IMPACT DAMAGE. 3M TAPE IS CONSTRUCTED WITH A PRESSURE-SENSITIVE, NATURAL RUBBER ADHESIVE PROTECTED WITH AN EASY-RELEASE PAPER LINER. TOTALLY CLEAR AND RESISTENT TO YELLOWING. TOTAL APPLIED THICKNESS IS 0.36mm. PLEASE NOTE THAT THIS IS FOR A 1M STRIP, HOWEVER THIS TAPE IS ALSO AVAILABLE IN ROLLS. PLEASE CONTACT US FOR DETAILS.